THE TROGLO OF LEONARD opened in June 2014 is an unusual cottage nestled in the historic heart of Amboise. Sleeps 2 to 4 people. New in June 2019: enclosed garden with panoramic views of Amboise, available to tenants. 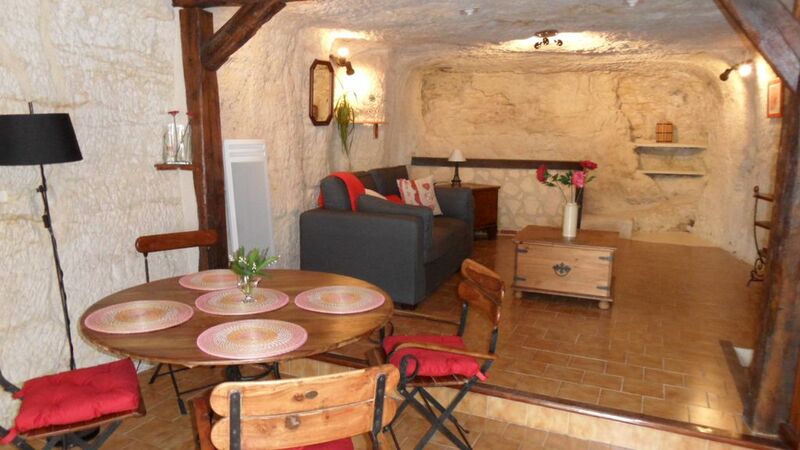 This troglodyte dwelling of 72 m2 (800 square feet) dug in the tuffeau is ideally located between the historic Château d'Amboise, Château Gaillard and Clos Lucé (last home of Leonardo da Vinci). It has a stunning panoramic view of the city and its monuments and lies on the route of the Loire by bike. This house renovated with care consists of a pleasant living room about 40m2 including a south facing dining area with fireplace and kitchen and a cave lounge with sofa bed 140, armchairs, coffee table, and maie TV. A large room of 12 m2 with 1 bed 140. Shower room with WC and walk-in shower. A kitchen equipped with crockery and utensils for 4 people, classic oven, microwave oven, combined fridge-freezer, induction hob, coffee maker, kettle, toaster. The room is facing south, you will sleep in bed with new bedding consists of a 140 slatted base and mattress 20 cm thick latex (natural and hygienic material) you will find many taken current, large wardrobe, chest of drawers and 2 bedside tables to store your belongings and a closet in the rock to store bags! The bathroom carved into the rock is completely renovated and equipped with a spacious walk-in shower (100x90), a washbasin, a hairdryer, a heated towel rack, of a washing machine and toilet macerator. Sheets and towels provided. Beds made on your arrival. Cleaning included. Possibility to store 2 bikes in the living room and park your car in front of the house. In winter the wood for the fireplace is provided. The town of Amboise is part of the Val de Loire World Heritage of Unesco and is on the route of "La Loire à Vélo". You will find many gourmet restaurants, wine bars, various shops, a cinema, a lively Sunday morning market and renowned for the quality of its products and a summer pool "Golden Island. Many festivities are held throughout the year including night show "The Amboise prophecy" every Wednesday night and Saturday evenings in July and August. The cottage "The Troglo Leonardo" is ideally situated to allow you to go on foot in all those places and in many historical sites of the city center: Le Clos Lucé, the Castle, the panoramic view of the plateau Chateliers, City Hall, the Belfry, the collegiate church of Saint Denis, the church of Saint Florentine, St. John's Chapel in the Golden Island and Notre -Dame -from Bout des Ponts. You can go by bike or car in town of Amboise to discover the Chanteloup Pagoda whose summit is visible from the house, or the mini-castles park. For fans of the train line serves the TGV Paris in 55 minutes via Tours train station, then TER connection with Amboise. This was our first time staying in one of the troglodytes that are in the Amboise area. The location was great and easy to get to the town center as well as the Royal Château Amboise. Lots of great restaurants and shopping near by. Our host was very warm and gave us great recommendations for the area. The unit was roomy yet cozy and we had enough space for 2 adults and 2 pre-teens. We loved relaxing in the evening in front of the fireplace. I highly recommend this unit and would not hesitate to frequent it again if we happen to return to Amboise. Dear Paul and Shannon, It has been a real pleasure hosting your family. Thank you for the little present. Loved this place! Owner very friendly and accommodating. Fireplace a big plus! Beds comfortable and home immaculate! Would return without question! It has been a pleasure hosting you. Great property and wonderful host. A real gem. Nicely decorated with perfect amenities for our stay. Amboise is a perfect home base for exploring the Loire Valley. Only suggestion is for directions on reaching the property. Many 1 way roads in the Amboise area that our rental car GPS did not know and google maps did not handle well. Great location! We walked to the sights we wanted to see. Laurence was extremely friendly and helpful. The cave setting is a novelty, and comfort is not sacrificed. Our host was helpful and gracious, and her affection for the property is readily apparent. The location, between the Chateau, gardens, and Leonardo’s villa was ideal, with a short walk to all the restaurants and the weekly market. Laurence was so nice and informative. The troglodyte is just as it appears in the photos.